Spring is here, and with it, a shiny new Memberships release! This WooCommerce Memberships release cycle focused on two main components: free shipping for members and batch processing. It also comes with a number of new improvements and lots of tweaks under the hood we hope you’ll love. Create your own “prime” shipping for store members! Member perks related to products have only included product discounts thus far. Although this feature, along with restrictions and integration with Subscriptions, provides a lot of flexibility for marketing and sales strategies, it’s time for Memberships to step into other stages of the eCommerce experience. The most logical place for this is shipping. You may have heard of a worldwide eCommerce platform that demonstrates to us the power of giving customers discounted, fast shipping. 😉 Based on our data at Jilt, we also know that unexpected shipping costs are the most common cause of cart abandonment. Discounted, free, or faster shipping for members reduces abandonment, increases cart size, and boosts loyalty. 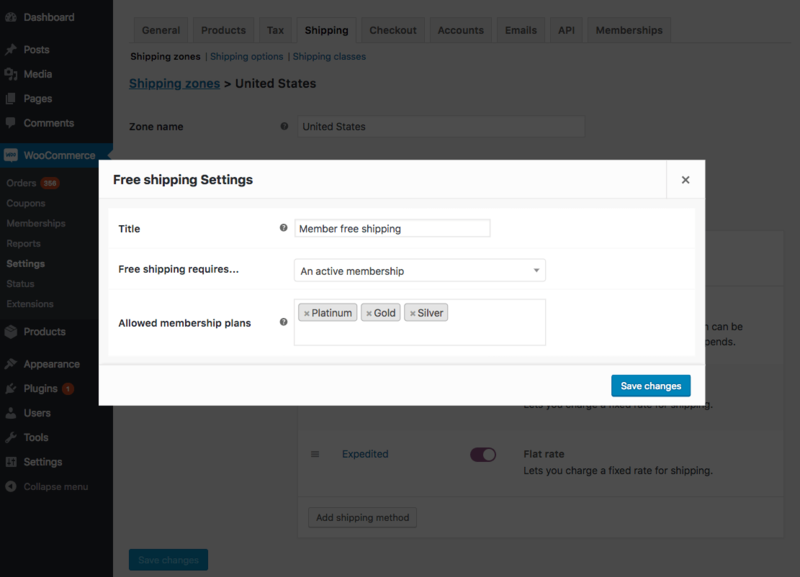 WooCommerce Memberships 1.10 now lets you address shipping costs for your members to reduce cart abandonment and increase loyalty by offering free shipping for your members. One small, but important note. 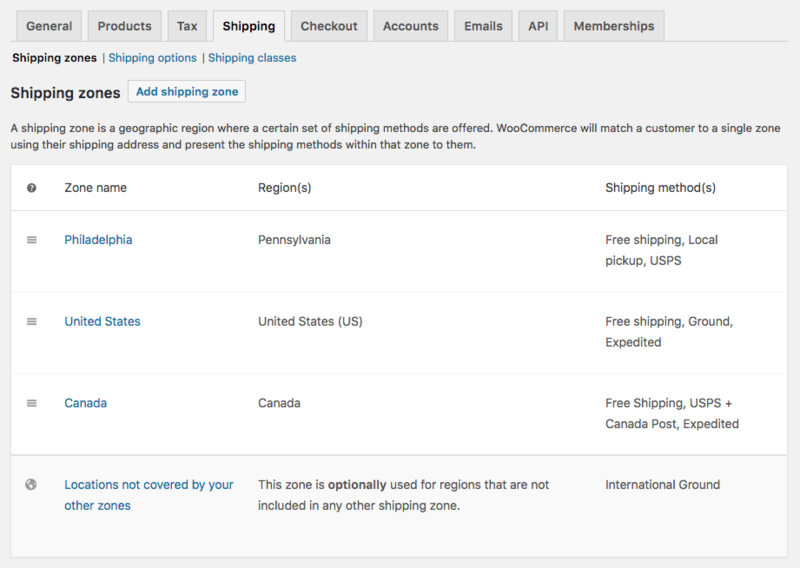 This feature requires WooCommerce 3.2 due to a technical requirement for restricting shipping methods. As always, we encourage to stay updated with WooCommerce and adopt the latest version as soon as you can. That’s it! From now on all members of those plans will be offered free shipping on their purchases when they are matched to this shipping zone. Even if you do tie free shipping to membership, you may still want to offer free shipping to non-members for certain order values. You can do so by including another free shipping rate, and blocking members from seeing it (since they’ll already see the member free shipping) so non-members can take advantage of free shipping in some cases, too. We can’t wait to see how merchants leverage this new tool in their stores and learn from their feedback to expand it even further! We’d love to hear about how you’re using shipping for your members, so let us know. At SkyVerge, a number of our plugins must perform certain tasks in “batches” for best performance and efficiency — these batches let our plugins perform tasks that take a long time, like order imports or exports, without running into timeouts or errors on your site. We knew Memberships could benefit from this approach for a number of existing features, so we’ve implemented better bulk-processing in version 1.10. Memberships version 1.6 added the ability to import and export user memberships into and out of your site. The code handling these tasks would process all data in the CSV file at once. However, when working with large datasets, even the most powerful servers can face timeouts when processing thousands of memberships at once. Less powerful servers could have issues at smaller numbers of records, as well. While we could work around this by limiting the records in an export, or by breaking import files into multiple sets of records, neither of these solutions is ideal, nor was intended to be permanent. Now that we’ve battle-tested the ability to batch-process records in our other plugins, we’ve brought batch processing to member imports and exports. These utilities can run more efficiently and elegantly, with a modal window displaying a status progress bar so you can track how far you are from completion. 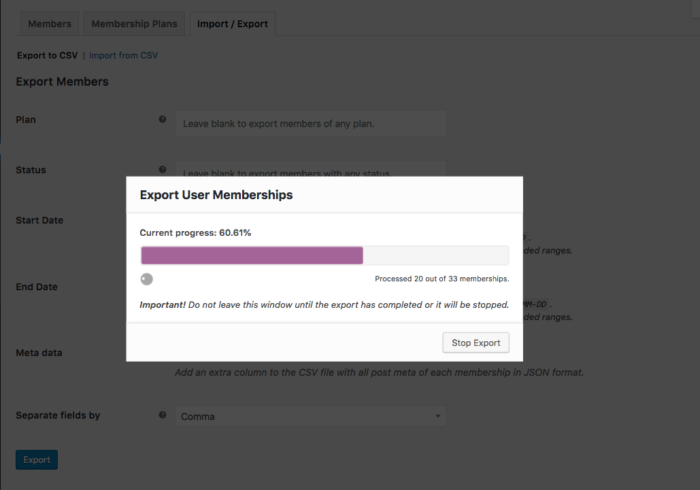 This avoids timeouts while processing large member imports or exports, helping you manage bulk changes more efficiently. Memberships version 1.7 added member emails to inform members when their membership was about to expire, when it had ended, or to prompt them to renew. In the settings for each email, merchants can also define the number of days relative to the expiration of the membership when each email should be sent. However, changing this setting only changed the timing for newly-scheduled emails. We’ve now added the ability to reschedule existing emails in bulk, so you can change all your email sending times. 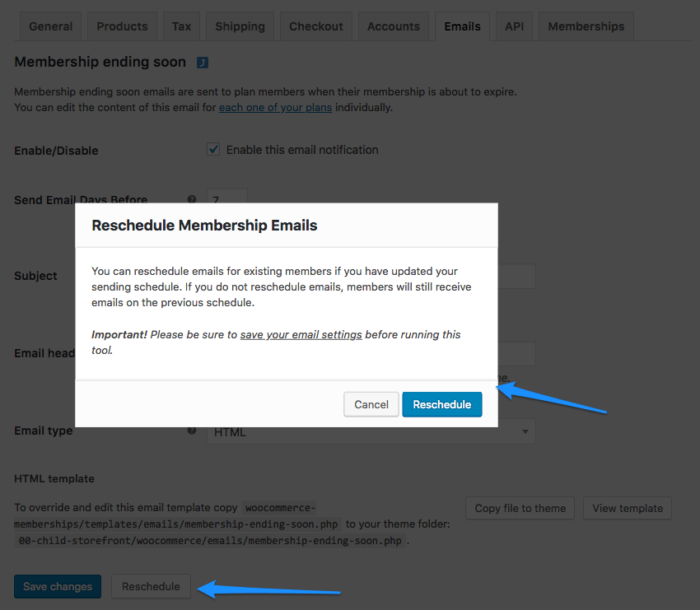 In the Membership Ending Soon Email or the Renewal Reminder Email areas, merchants will now find a button that lets you reschedule all the events connected with the email being sent. Like the import and export processes, you can follow the progress of this task from the panel that opens to handle the rescheduling tool. WooCommerce Memberships has always offered the ability to retroactively create memberships for customers who have purchased membership products in the past. For example, say John bought product X before the store started using Memberships. Then, the store installs the plugin and creates a plan that offers membership to anyone who purchases product X. 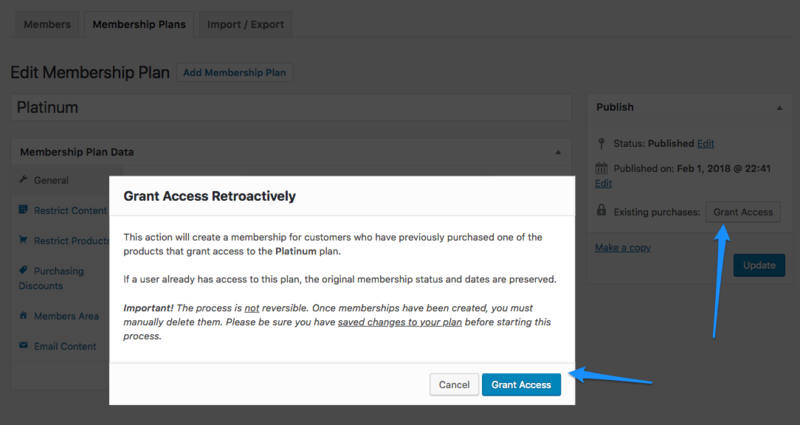 By clicking the “Grant Access” button for the new plan, the merchant could extend the membership to John. This worked out well for many sites migrating to, or adding, Memberships. However, like the import and export processes, it was a feature prone to hit server and software limitations. With batch processing, this task can be carried out entirely in batches to avoid performance issues. And there’s more! 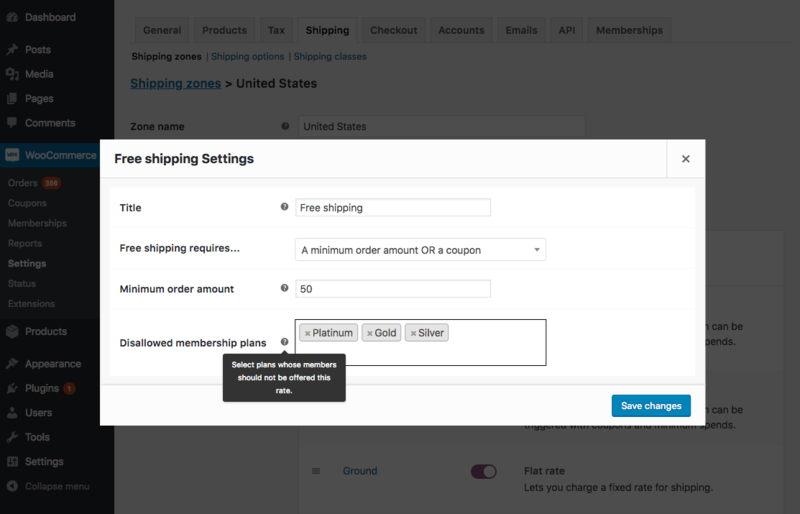 In version 1.7, we added a new way to get access to a plan upon customer registration instead of product purchase. These plans were excluded from retroactively granting access due to performance concerns (since it meant creating memberships for every user). With batch processing, there is no such concern, so you can create free user memberships for your entire user base by using the “Grant access” tool. A common question we get from new merchants when they start using Memberships is: “Why can I see content that should be restricted?W Often, these merchants are testing members-only content with their administrator or shop manager site account. It’s necessary to let these privileged users view all content so they can manage it for their site. However, it can be confusing to see something you don’t expect to, or to know that you should test these restrictions in a new browser or incognito window. To help these new Memberships users work with the plugin, we’ve added a notice to restricted content when logged in as an administrator or shop manager to remind you that content will be restricted when viewed by a guest or non-member. Memberships 1.10 contains several fixes and tweaks that will improve your experience as a merchant or for your customers; as always, I’d invite you to go through the changelog to check the main items covered. Notably for developers, Memberships adds support for WP CLI 1.5: if you are using this fantastic command line tool and it stopped working for you with Memberships after update to 1.5, you should check if the site you’re working on has the most recent Memberships version installed! We recently released Teams for Memberships, and more add ons are coming to Memberships this year. Stay tuned for our next add on, which will synchronize your members list with Mailchimp! Fulvio is a WordPress engineer, and spends most of his time on new plugin development and updating existing plugins. 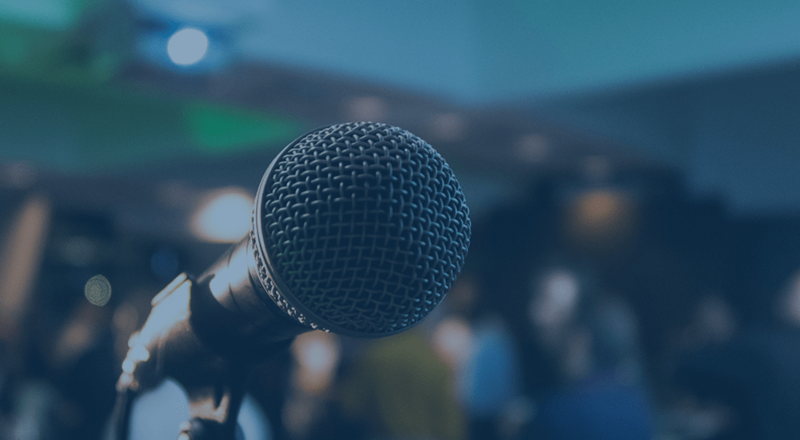 You'll find him on the SkyVerge blog keeping you in the loop on what's new with our plugins, along with helping in your support threads. Woot, Batch-processing – can’t wait to try it out. Thanks for the update folks. So great to have a development team who are really making such a good effort! 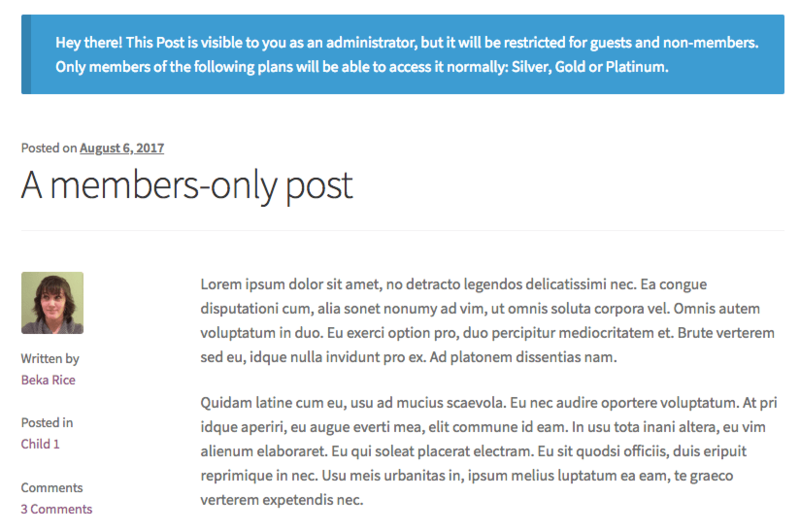 2) The “notice to restricted content when logged in as an administrator” has managed to find its way into every little nook and cranny (sideposts, footer posts – wherever there is a membership article mentioned!) Perhaps try to restrict this notice to one message at the top of the page for logged in administrators? 3) RE Mailchimp – not everyone uses it. How about an option for campaign monitor too? Or at least the option to send the data via an API. One question – with the “Membership ending soon” etc emails – how does that tie in with subscriptions? Hey Alex! RE the restricted content notice, our team has gotten some feedback here similar to what you’ve noted, so thanks for sharing this! We’re working on ways to limit where it’s rendered. Our team also has a snippet to disable it if you’d like, so please feel free to reach out and we’d be happy to share it. Finally, membership “ending soon” emails only relate to subscriptions when the membership is not tied to subscription length (has a set end date). If the membership is tied to subscription length, then it never has a real “end date”, and therefore, has no timeline to send those emails. Subscription-based emails is something we’re excited to include support for within Jilt, so we’re starting work on that shortly!